Margaret K. McElderry Books, 9781416902102, 96pp. 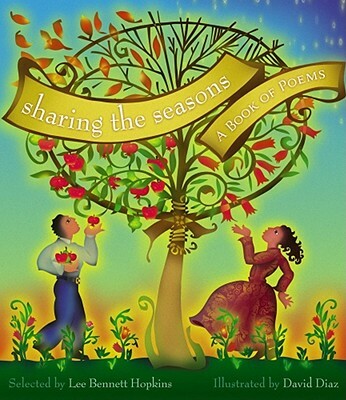 Combining a diverse selection of classic quotations and forty-eight poems, twelve for each of the four seasons, with the energetic and colorful paintings of a Caldecott Medal winning illustratror, this is the definitive collection of poems about the seasons for children and adults. Spring births a polliwog that becomes a "full frog"; in summer, wildflowers choreograph an extravaganza; autumn's apples are found in generations of people's pockets; and winter's snowfall makes inanimate objects more beautiful than we could ever imagine. In addition to master poets Carl Sandburg, Richard Brautigan, Joseph Bruhac, and Karla Kuskin, twnety-nine of the poems have been especially commissioned by a host of contemporary poets such as Rebecca Kai Dotlich, Joan Bransfield Graham, J. Patrick Lewis, and Marilyn Singer. The exciting, bold palette of Caldecott Medallist David Diaz brings the seasons to life and asks us to look at the seasons all over again, for the first time. LEE BENNETT HOPKINS is a distinguished poet, writer, and anthologist whose poetry collections include the highly acclaimed Hand in Hand: An American History Through Poetry, illustrated by Peter Fiore, and My America: A Poetry Atlas of the United States, and America at War, both illustrated by Stephen Alcorn. Mr. Hopkins’s numerous awards include the University of Southern Mississippi Medallion for “lasting contributions to children’s literature” and both the Christopher Award and a Golden Kite Honor for his verse novel Been to Yesterdays: Poems of a Life. He lives in Cape Coral, Florida.